If constructed, the massive Koll Center Residences project would be the tallest and largest condo towers in Newport Beach history. Its approval would usher in a new era of ugly, high-rise condo towers. In addition to this terrible precedent, the project would set another negative precedent by dramatically intensifying building heights and density beyond what was originally intended and what is compatible with surrounding properties. the general plan AND "LIVABLE RESIDENTIAL VILLAGES"
We support the concept of redeveloping underutilized or underperforming properties into more vibrant neighborhoods. We also support the concepts of livable residential villages, more open space and pedestrian connectivity. The problem with the Koll Residences condo towers is that they fundamentally fail to fulfill those goals. 1. To ensure that new developments improve our existing community rather than degrade it, the General Plan requires in its "Growth and Change" element that development should "enhance existing neighborhoods...with uses that are complementary in type, form, scale and character" (GP LU 3.2). FAIL: The tallest and largest condo tower development in Newport Beach history would not be a use that is "complementary in type, form, scale and character" to its existing neighborhood. Rather than being a complementary development, the Koll high-rises would be crammed into a shared surface parking area of an existing office park. Surrounding office buildings there are on average 2 to 4 stories and nearly a hundred feet smaller than the 160-foot, 13-story proposed Koll condo towers. The negative impacts to existing property owners and the overall character of Newport Beach would be enormous. 2. The General Plan acknowledges in its guidelines that high-rises can cause detrimental building massing. Accordingly, the General Plan requires that any new "high-rises be surrounded with low- and mid-rise structures fronting public streets and pedestrian ways or other means to promote a more pedestrian scale" (GP LU 6.15.22). FAIL: The Koll Residences proposal has this requirement backwards, with the Koll Residences high-rises themselves fronting the public streets rather than low- and mid-rise structures. In fact, two of the proposed Koll high-rises front two public streets. This is clearly in contradiction to the General Plan and also the community's goals for livable, human-scale neighborhoods. 3. There is a clear General Plan requirement for "compatible and cohesive integration of new housing with existing non-residential structures" (GP LU 6.15.10). The heights of existing uses must be considered, as well as potential glare, shading and building massing impacts of new development. 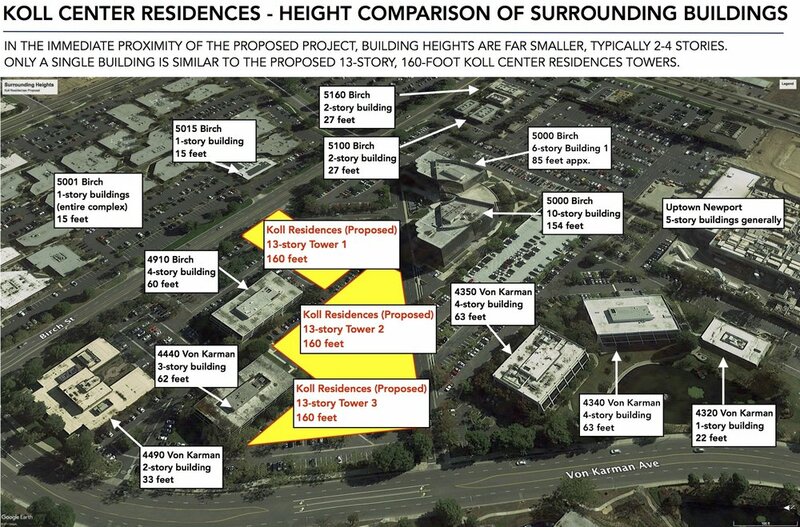 FAIL: The buildings immediately surrounding the proposed Koll Residences are substantially smaller. The massive Koll Residences condo towers would dwarf these existing properties, blocking their views, shading their buildings, and negatively impacting their property values. The best judges of whether a new development would properly integrate with existing buildings is, of course, the owners of the existing buildings. Yet nearly every single surrounding property owner is opposed to the Koll Residences condo towers because they are too tall, too high-density and egregiously fail to be properly integrated with the existing buildings. 4. The General Plan requires that the "scale of growth and new development shall be coordinated with the provision of adequate infrastructure" (GP LU 3.2) so that traffic and growth are balanced in a responsible manner. FAIL: The proposed Koll Residences would add more than 1,200 daily trips to streets already experiencing significant traffic gridlock. Just down the street from the Koll Residences project, thousands of new apartments and townhouses are being built in Irvine. Adjoining this project, the Uptown Newport development is under construction with 1,244 new residences. The cumulative effects of this vast number of new units in a small area have not yet been fully realized. Developers continually claim their projects will not increase traffic or that traffic can be "mitigated" -- but what are you experiencing in real life every day when you drive? Traffic is already bad and it is getting substantially worse every year. In addition, because the location of the Koll condo towers lacks adequate restaurants, retail, parks and beaches, the condo tower residents will need to drive elsewhere in Newport for those things, including to your neighborhood. The Koll Residences provide only a tiny 3,000 square feet of retail in their 1,000,000+ square foot development. 5. The General Plan clearly states that any new residential units in this area shall be "centered on a neighborhood park and other amenities" (GP LU 6.15.6) in order to provide a strong sense of identity and neighborhood livability. FAIL: Original plans pushed by the Developer for the Koll site show low- and mid-rise residential positioned around a large, central neighborhood park. However, when the Developer actually submitted its plans, it changed the concept to high-rise condo towers and moved the park away from the center and into the far eastern corner of the site. Guess where the tiny park is now? Directly in front of the headquarters of the Developer's major financial partner, Picerne Group.